Fifteen Ninety Nine Glasgow Weddings. 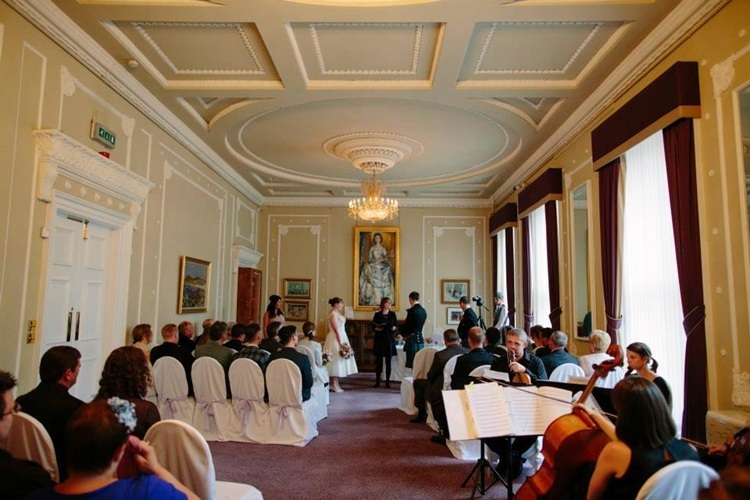 View this perfect wedding venues in Glasgow for your reception or wedding ceremony. Welcome to Glasgow's hidden jewel — Fifteen Ninety Nine is a slice of Victorian elegance hidden in the heart of the city. We offer a collection of unique rooms and function suites for your special day. Immersed in regal history, each individually styled room offers a variety of choices for your wedding. Experience the enthralling character and timeless charm our incredible building offers. With years of experience in hosting events, you can be assured that you will receive unrivalled service. You will be granted exclusive access to our building for your wedding. We have a selection of rooms which accommodate up to 100 people for a ceremony and wedding breakfast, and up to 150 for an evening reception. 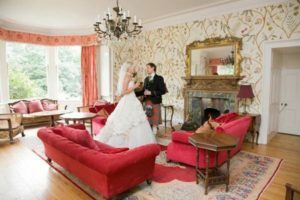 With our licence to hold civil ceremonies, we can provide a complete wedding package in the most beautiful settings for you to exchange your vows. Your wedding venue is the backdrop to your celebrations, and hosting at the magnificent Fifteen Ninety Nine ensures your day will be an occasion to remember. We welcome weddings on Saturdays and Sundays. 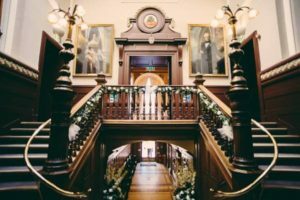 Your perfect day could begin with a ceremony in The Princess Alexandra Room, followed by an intimate champagne reception in The Lower Library. 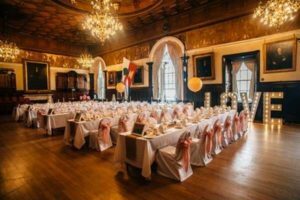 Then celebrate in style with your wedding breakfast, prepared in house by our award-winning chef, in the magnificent College Hall. To end, why not finish by dancing the night away under our magnificent glass ceilings with your friends and family. The Princess Alexandra Room exudes elegance and beauty, with traditional period features and an added touch of glamour with its original chandeliers. This former drawing room is named after Her Royal Highness, Princess Alexandra, who became the College's first Royal Honorary Fellow in 1959. Her portrait hangs proudly in the room. 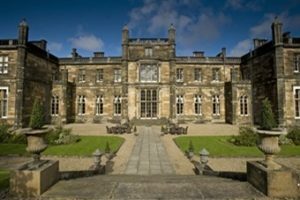 The College Hall is the largest suite and is one of the grandest, offering a unique and unforgettable experience for a city centre location. 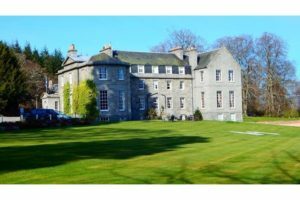 Original features include Rennie Mackintosh stained glass windows, Victorian fireplace, a sweeping mahogany staircase and spectacular chandeliers. 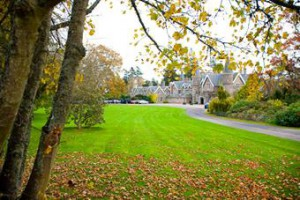 It was purpose built in 1892 as a venue for formal events and college ceremonies. Finally, The Lower Library is a striking room, rich in history and traditional features. The shelves currently hold books and artefacts dated back to late 19th and early 20th century. Our beautiful selection of rooms provides an idyllic setting that can be tailored to give you the day that you always wanted. 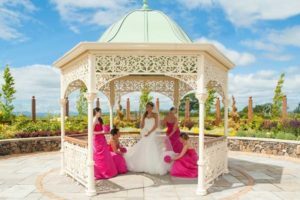 Our dedicated Events team are hugely experienced and motivated to help deliver an idyllic event, so you can relax and enjoy your occasion. 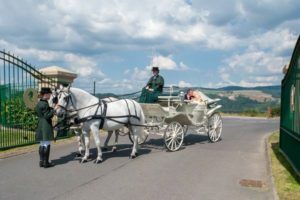 We guarantee that we will provide you with a seamless service and all the support you need to ensure you and your guests will have the perfect day. Our award-winning Chef and his skilled team are dedicated to providing you and your guests with exceptional food and service. Food is their passion and they endeavour to provide creative and original menus using the freshest seasonal ingredients sourced from local suppliers. From pan roasted Scottish salmon to pistachio ice cream, canapés to crudités, and from a simple finger buffet to elegant dining for up to 100, we promise to deliver a dining experience that will complement your wedding perfectly. We offer bespoke packages to suit all tastes and dietary requirements. We will work with you, sharing what we have learned from our years of experience to create a tailor-made menu for your special day.